All parents, like me, likes to know what their baby is doing at night. Is he playing? crying? screaming? It's your job as a responsible adult.. (Yeah right!) to know what is going on in your little angel's bedroom. A device that can help you tremendously without costing you too much is a baby monitor. There's tons and tons of models out there: 900Mhz, 2.4Ghz and even some Bluetooth models. Yes, you heard me, a Bluetooth baby monitor. I couldn't believe my eyes after seeing this in the store. My geeky brain was yelling at me to purchase this model right there on the spot, even if I had absolutely NO IDEA AT ALL if this product was any good. 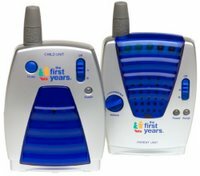 Bluetooth was first invented to solve interference problems with other 2.4GHZ Device, radios, phones and certain baby monitors. The Bluetooth device deals with this problem by randomly jumping around 79 different channels. If a packet is lost because of interference, it is immediately retransmitted. unfortunately, my wife had something to say about the decision, and the little gadget (It was a gadget for me :) ) was a bit overpriced. So we purchased a 2.4GHZ conventional model. It turned out that this was a good decision. The sound was crystal clear, and the maximum range between the transmitter and the receiver was more then acceptable. I was able to walk outside to the end of my street (about 120 meters, +/-400 feet) , and was still receiving the signal without any loss. I think the possible range of the device goes up to 500 meters /1500 feet , which is more then enough. I heard that some people could have some interference problem with other 2.4ghz devices that are in their neighborhood. We didnt experience any problem yet, but if we do someday and my wife complains, i'll just tell her that she should have listened to me and get that Bluetooth model back when we shopped for it. "Digital technology provides ultimate privacy and clarity in monitors. Fully digital units communicate exclusively with one another, so there is no outside interference. Monitor instantly finds clearest channel (16 channel auto-scan). Parent unit features a screen so you can see baby's sounds. Includes AC adapters to plug parent and child units into standard electrical outlets. Compact, ergonomic design for easy carrying." ...i will get another when the next one comes along... now all i need is a 4-way screen splitter that won't break the bank.